The Hello Foundation introduces speech-language therapy for modern times as Hello There, a videoconferencing platform that radically changes how speech-language teletherapy is delivered. Hello There is designed to serve many of the 6-8 million people in the U.S. with speech and language impairments and to pivot the industry toward engaging a client’s circle of influence in speech-language therapy. Hello Online is speech-language therapy that wraps around YOU! "It’s the best possible scenario for kids to be making progress.” says Sharon Soliday, owner and CEO. Speech-language therapy can help adults and children improve communications at all levels. From a 5-year-old child with autism to a client impacted by a stroke, therapy success comes from including all primary environments and key players in a client’s world. The standard model in the industry of speech-language therapy is one-on-one (client-and-clinician) in a school, hospital, or clinic setting or within online videoconferencing. The participants are the client and the therapist. However, this model is limited and its success is dependent on the client remembering to practice outside of the therapy session. Lack of practice can significantly slow the progress of therapy and frustrate everyone involved. clients are in charge of who is invited to join their family account, meaning that physicians, health care professionals, teachers, grandparents, and others can be active participants in the therapeutic process. therapy sessions are recorded and available to the client and others with account access for later review. 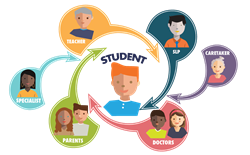 documents, school work, and video/audio samples can be uploaded and shared between those in the family account and the clinician. treatment plans and progress notes are plainly written and available for all to access at any time. secure, direct messaging allows clients to have access to their clinician whenever the need arises. http://www.thehellofoundation.com Find us on Facebook, Twitter, Instagram, LinkedIn and YouTube.